During the early Stone Age period, there was little sign of human habitation in Cornwall, although there are signs of occasional visitors from elsewhere. The Mesolithic era - the Middle Stone Age from about 10,000 BC - was the end of the last glacial period when water levels began to rise. 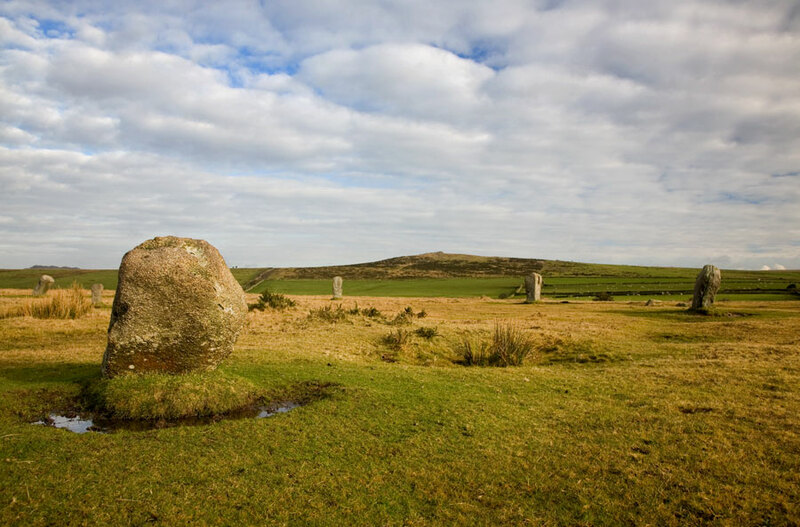 Hunter-gatherers begin to settle around the coastline of Cornwall and evidence can be found around the Lizard, for example, and on upland areas such as Bodmin Moor. Between 4,000 and 2,500 BC in the Neolithic or new Stone Age there was great social and agricultural development. Farming began and there was increased monument construction, as the population increased. Settlements, such as the one on top of Carn Brea, begin to be fortified. The first Cornish hedges appeared, enclosing land for cereal crops. The Early Bronze Age between 2,400 and 1,500BC saw the introduction of metal working. The use of bronze exploited Cornwall’s natural resources of tin and copper. These metals were found by tin-streaming and open-cast mining. During this period there were many more ceremonial and burial monuments: the stone circles, rows and standing stones or menhirs, and the barrows with their “kist” graves, hollowed out of stone. From 1,500 - 600 BC during the Late Bronze Age, the climate became wetter causing movement of the settlements to lowland sites such as Trethellan, Newquay. The nature of farming changed to less intensive grazing on the uplands. As a result, a more warlike society evolved which often sacrificed weapons to their gods. 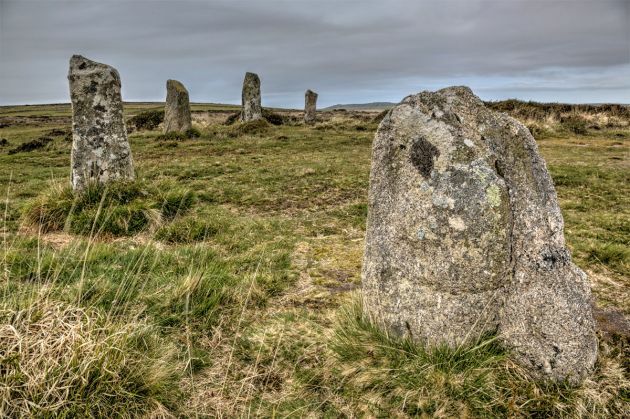 Although it has long been believed that the first Celts arrived in Britain around 600BC, some recent scholarship suggests this possibly happened as early as 2000 BC. During the late 1st century AD, Roman military occupation of Britain began. At this time the part of Britain annexed by Rome was divided among various tribes. The south west was occupied by the Dumnonii, Iron Age Celts who had been in the area for centuries. 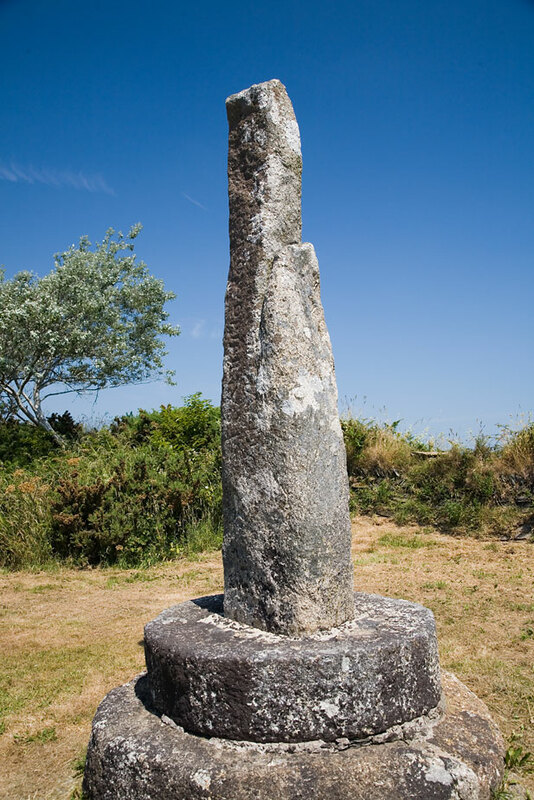 The rural society in Cornwall was largely unchanged by the Roman influence. One fort was built, at Nanstallon on the River Camel, but was only occupied for twenty years; and there was one villa, at Magor, Camborne. Trade in tin increased during the 3rd and 4th centuries AD, not only for bronze, but also to combine with lead for pewter objects. New trading posts were set up such as the one at Carvossa, Probus. Courtyard houses appeared at this time in villages such as Chysauster, Penzance. 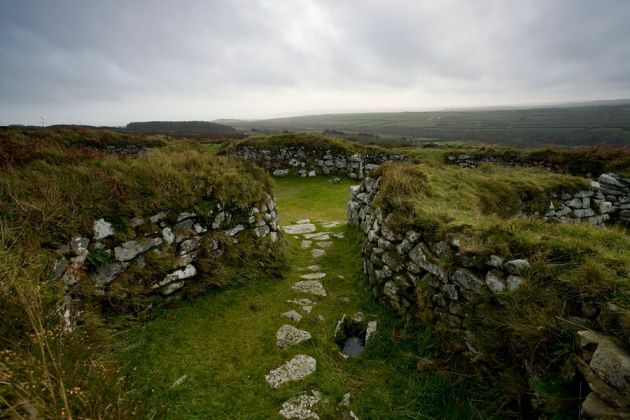 During the first millennium AD, what is now Cornwall evolved from a Roman division of territory. It became known by its Late British name, Cornouia, the land of the Cornovii. There appears to have been a succession of Dumnonian Kings right through to the 9th century, and there is a 10th century memorial to King Ricatus in the grounds of Penlee House, Penzance. Cornouia became Cornubia (Latin), Cernyw (Welsh) and Kernow (Cornish). The language evolved into Cornish. During the 6th and 7th centuries there was an English invasion of Cornwall. This was the period of Arthur, Doniert & other Celtic kings including King Mark. It was also known as The Age of the Saints. Many legends associate King Arthur with Cornwall. He was said to have been born in Tintagel, at the home of Gorlais, Earl of Cornwall. It was here that Uther Pendragon seduced Igerna, Arthur’s mother. The castle ruins at Tintagel are 11th century, but there are signs of a much earlier settlement. Merlin’s Cave is below the castle is known as and the magician is said to haunt it. Arthur is said to be reincarnated as a Cornish chough. King Mark was said to have lived at Castle Dore, Fowey. Legend says that Mark sent his nephew, Tristan, to Ireland to bring back the fair Iseult to be queen. However the young couple accidentally swallowed a love potion and fell passionately in love. Iseult married Mark and the story inevitably had a tragic ending. In 577, the Battle of Deorham Down near Bristol resulted in the separation of the Cornish (known as the West Welsh) from the Welsh by the advance of the Saxons. By this time, the Saxons had destroyed the remains of Roman civilisation and it was almost forgotten in the west. The Saxons were established and they were converting their conquests to Roman Christianity. Not long after this the earliest Christian church opened at St. Piran’s Oratory. St Piran became the patron saint of Cornwall and of tin miners. His flag is a white cross on a black background. St Piran’s Day is celebrated on March 5th. He is the most famous of the Irish saints who came to Cornwall and is said to have discovered tin and to have founded the monastery of Clonmacnois. Legend says the heathen Irish tied him to a mill-stone, rolled it over the edge of a cliff into a stormy sea, which immediately became calm. The saint floated safely over the water to land upon the sandy beach of Perranzabulo in Cornwall, where his first converts were animals. In 664 The Synod of Whitby determined that England was again an ecclesiastical province of Rome, with a formal structure of dioceses and parishes. The Celtic Church of Dumnonia was not party to the decision and the Cornish Church remained monastic in nature. Around 710, Ina, King of the West Saxons, attempted to destroy Dumnonia. Over the next fifty years, several battles took place with the Saxons mainly victorious. However, in 722, Roderic, King of the Britons in Wales and Cornwall, repelled Adelred, King of Wessex. In 807 Viking Danes formed an alliance with the Cornish against the Saxons. The Saxon, Egbert of Wessex conquered Cornwall in 814 but was unsuccessful in subjugating the people despite having laid waste the land. The Cornish eventually rose against Egbert only to be defeated at Galford on the River Lew in West Devon. 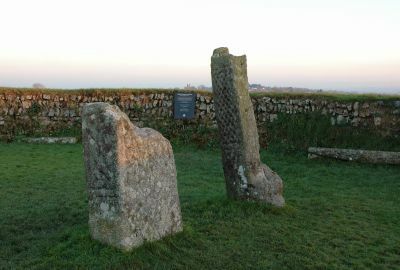 In 838 a Cornish-Danish alliance was initially successful in a number of skirmishes with Egbert, but was eventually defeated in a pitched battle at Hingston Down, near Callington. This was the last battle against the Saxons. Athelstan, the grandson of Alfred, attacked the south western Celts in 927, forcing their withdrawal from Exeter. There is no record of him taking his campaigns into Cornwall. It seems probable that Hywel, King of the Cornish, agreed to pay tribute thus avoiding further attacks and maintaining a high degree of autonomy. This supposition is supported by the fact that, in 931 King Athelstan set up a bishopric at St. Germans. In 936 Athelstan’s settlement had fixed the east bank of the River Tamar as the boundary between Anglo-Saxon Wessex and Celtic Cornwall. The river still marks the division between Cornwall and Devon. After the Norman Conquest in 1066, Robert of Mortain became Earl of Cornwall and built a castle at Launceston. Earl Ordulf was in charge of Moresk Castle, Truro. The story of Cornwall was continued in the Domesday Book.